Competition among healthcare providers gets steeper by the day. For pediatric practices, keeping existing patients and continually bringing in new patients is critical for survival. Today’s parents of children under 18 – Millennials and Gen Xers – don’t consume health information or select pediatricians the same way their parents did. Designed specifically for pediatric practices to best communicate with 21st Century parents, our e-newsletter program gives your practice the competitive advantage to not only survive, but to thrive. 70% of them find a pediatrician through referrals from friends and family. At the end of 2014, 53% of total e-mail opens occurred on a mobile phone or tablet. The number of mobile e-mail users is predicted to grow 22% in 2015 and 23% in 2016. Mock content shown above is purely for illustrative purposes. *SPECIAL OFFER: Sign up for a Full-Year Program by Dec. 31, 2015, and we’ll waive your setup fee! Q: My staff and I are busy – what exactly will our involvement need to be? A: Our goal is to make things as quick and simple for you as possible, but we will need a few things from you to make this program a success. During setup we will need you to send us: your logo, a completed form that will provide us with the static content included in every issue, and your patients’ e-mail addresses. Each month, we will ask you to send us your practice news (typically 2 to 4 100-word articles, but this is your preference) and new patient e-mail addresses. Finally, we’ll send you a proof for final approval before distribution. On average, expect to spend about an hour helping us during the setup stage, and a total of about one hour every month. Q: What will our e-newsletter look like? 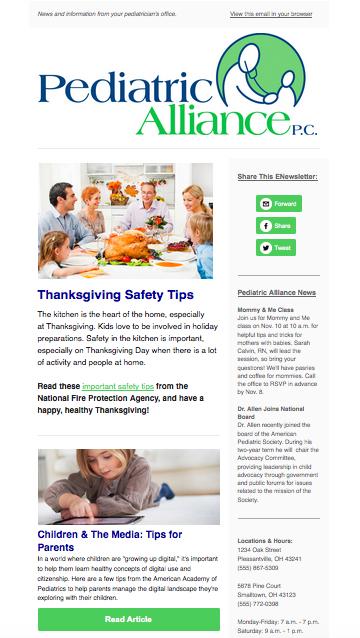 A: Your e-newsletter layout will look similar to the example provided above and seen here. Your layout will include your logo (or a custom-designed masthead) at the top, and we will incorporate the colors used in your logo and on your website throughout the e-newsletter template, to maintain brand consistency with your other online marketing materials. Q: Where do you get the e-mail addresses? A: You provide us with your entire patient e-mail database in an Excel file for importing during the setup stage. Then, each month you can provide us with new patient e-mail addresses to add to your distribution list. Your e-newsletter will also include a “Subscribe” button. 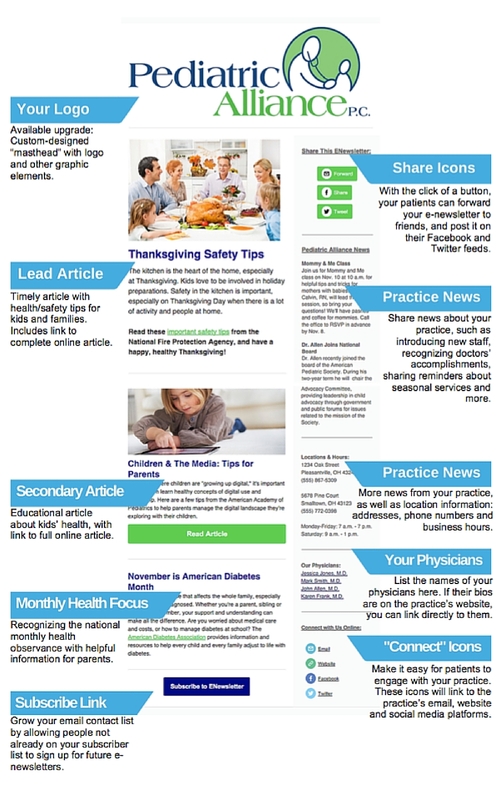 This means that if your patients forward your e-newsletter to a friend or share it on social media, the reader can opt to subscribe to your e-newsletter mailing list. Q: How many articles are included in each issue? A: In each issue, we include three pre-written articles on timely topics related to child and family health and wellness. You can also submit up to four (4) 100-word articles per issue with news, information and announcements specific to your practice. Our professional editors will edit the articles you submit for grammar and punctuation. Q: Where do you get the information for the pre-written articles? A: We use articles that are published by leading pediatric health/safety news and resource providers, including (but not limited to) the American Academy of Pediatrics, the National Health Information Center, and national health-advocacy organizations, such as the American Diabetes Association and the American Cancer Society. Q: Do we have to provide practice news? A: Providing at least one article per issue with news about your practice is recommended; however, it is not required. Q: What if we want you to write a special article for an issue, like a patient success story or physician profile? A: We are happy to write special articles for your practice that would fall outside of our standard offering. We charge $400 per article for articles up to 500 words. Q: How do we know whether our e-newsletter is being read? A: After each issue is distributed, we will send you an Analytics Report that shows insightful data, such as how many people opened your e-newsletter, how many links were clicked on, and how many times it was forwarded.